With no oils, pencils or electronic devices, this is a Christmas card to paint yourself. When you are finished, we hope you hear the music, too. Durham Cathedral — venerable, larger than life. A cold, rainy afternoon, everything feels grey. Inside, under the vaulted dome, candles pierce the pale air, lit by those who offered prayers earlier today. The seats begin to fill. Some come decked in holiday fashion, red, green, glittery. But most in the pews are not typical church-going fare. They don’t pretend to be pretentious. They can’t attempt the superficial. Outward appearance is of no consequence. They’re out-of-sight, sometimes ignored, best tucked away. The organ begins to play, the Cathedral choir files in. To open the Nine Lessons and Carols we rise, sing “Angels we have heard on high,” and sit. In that gap of silence, from the creak of wooden pews and the soft shuffle of clothes, a deep male voice bellows a loud dissonant melody. The program continues. No one silences the singer. Simultaneously sad and beautiful, mentally handicapped of all ages begin to create a huge tableau of angels in paper wings, shepherds, “wise” men. So brave, so proud they walk the 201-foot nave to their designated spots in front. An angel loses a halo. A shepherd trips. The golden cardboard crown tips off the tallest wise man. In the course of each Lesson and Carol, the Cathedral crossing fills with a hundred colorful figures. It is almost time for Mary, Joseph and the baby to complete the picture. The narrator can read, but only just. He’s been assigned several long passages of scripture (the Lessons) which are also printed in our program. He stumbles over the simplest words, though he has practiced them for months. He skips phrases he can’t tackle, sometimes entire lines (giving new meaning to Synoptic Gospels). This story predates my blog. On December 20, 2003 we attended a Cathedral carol service produced by MENCAP — the society for the mentally handicapped in County Durham. We were invited by our friends the Smiths who have foster cared the mentally challenged for years. I reread the story this year and was moved by the painting again. We are sad to report the extinction of the last Postum on the planet. “What is Postum?” some may ask. Postum was an instant coffee substitute made from roasted wheat, bran, molasses and corn. It was a “healthy” alternative invented in 1895 by CW Post — a student of Dr John Harvey Kellogg — who wanted to avoid drinking tea and coffee due to ill effects of caffeine. It was a Euro-American institution (in some circles) until Post/Kraft stopped production in 2007. Postum was marketed by an invisible cartoon ghost named, “Mister Coffee Nerves,” who would appear in situations wherein normal human characters were shown in uncomfortable life-situations (e.g. irritability, lack of sleep, loss of athletic prowess) due to their use of coffee and its negative effects. These cartoons always ended with the humans switching to Postum and Mister Coffee Nerves running away. 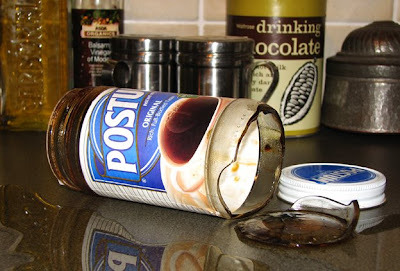 A jar of Postum was recently found in the dark corners of our pantry — probably the last Postum on the planet. The Postum in our jar was 21 years old (use by date: 1987). When it was opened a few weeks ago as one of Ani’s archaeological finds on our food shelves, it took a knife and some heavy pounding to flake off bits big enough to discolor a cup of hot water. Given her discovery, my wife got on a Postum kick that lasted a few weeks, probably due to the early arrival of winter’s cold, and decided today was the day to finish the last Postum (extinction of a species — errr specious beverage in my view). It was to be a ceremonious, nostalgic, fond memorial service. As we were making lunch, Ani, too cold to wait post-meal, heated water in the kettle, and without my being fully aware of what she was about to do, poured it into the Postum jar. Her logic was to get the last dregs she was unable to dig out by pounding knife. Before I could open my mouth, the jar cracked. Ani had already whirled around to find her cup, at the crucial brewing moment. I knew she better not pick up the jar — the crack was loud enough to know she needed a towel fast. As I began to say, “don’t pick it up,” she did, and the last hot Postum on the planet ran across the counter, under everything, into drawers, the cupboards below, and finally to the floor. So our cupboard and drawers are clean, and our counters are decorated with Tupperware, glassware, and whatever’s been washed and left to air-dry before it all goes back in. An unceremonious end to our 21-year old instant hot beverage, Postum Original, Rich Full-Bodied Taste. Being vegetarian is easy here. Fresh fruit and veg is well-presented, often prewashed, always overpriced. Prepared foods display a green “V,” and the grocer’s cooler is packed with sumptuous meals sans meat. But organic and vegan... The first, in its purest sense, I’m unable to afford; the latter, too lazy to embrace. In regard to veganism, I’ve adopted a less-than-ideal compromise. Much like “vegetarians” who eat fish and chicken, I presently drink soymilk and eat Feta. I’m a strict semi-vegan. Dairy is simply better here. 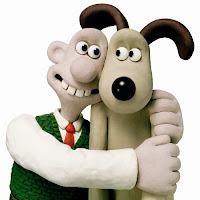 Exhibit A: Wallace and Gromit. 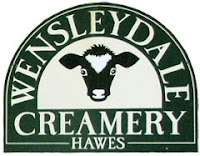 In addition to gleaning awards for extraordinary claymation, they unexpectedly revived the nearly-bankrupt Wenselydale Cheese Factory into a thriving dairy. Exhibit B: There’s no exhibit B. Take my word, or that of the adventure-seeking clay creatures who traveled far to find fine cheese. It isn’t just the cheese. If Google can’t yield a proper vegan creamer for my decaf, I remain in the camp of the cowards. Us vegan wannabes insist on full-flavor low-fat substitutes before we convert. Oh, don’t go there... Tofu doesn’t work no matter how much vanilla you pour in. Puréed almonds (plus vanilla) was someone else’s “delicious” idea. Any recipe with vanilla is suspect in this regard. I’m not making a smoothie, I want a creamy coffee. 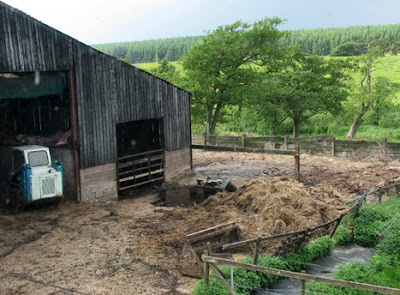 Organic, on the other hand, has become surprisingly feasible, with little effort and no extra cost. In the British Isles, “Display Until” and “Sell By” dates are observed more strictly than the Laws of Nature. Whether animal, fruit or vegetable, dates stamped on every consumable product wait to be expired and marked to half price or less. Remarkably many of these items are perkier than their “fresh” counterparts. And organic foods at half price are cheaper than regular foods at full price. A routine survey of yellow mark-down stickers yields a bagful of organic stuff for less. The sport has produced some interesting new flavors and unusual meals. Fennel in stir-fry was one such surprise. Celeriac soup, however, remains resident in the back of the freezer, a lifer beyond freezer-burn. 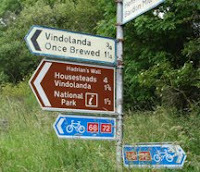 In this milieu, join us on a recent journey to Hadrian’s Wall, as we muse the very topic of health and wellness while Ben obeys the speed limit (for a change) behind an ozone-wrecking truck in a no-passing zone. Just then Providence smiles and we spot a hand-written card, not unlike “Will Work for Food.” With a crooked arrow pointing right, “Organic Café” it says. We agree to investigate and gladly trade our emissions trail for pristine farmland, cool crisp air, and the occasional whiff of honeysuckle and cowpasture. We turn into a small courtyard. There’s a farmhouse to the right, a shed-turned-toilet in the center, and a cozy Café to the left. An elderly dog wakes, moves wearily to my car door and sniffs. Don’t jump, I say through my teeth. He walks away, too tired to waste time on a transient. A middle-aged woman is fetching coal. Quaint. Chickens free-range everywhere. 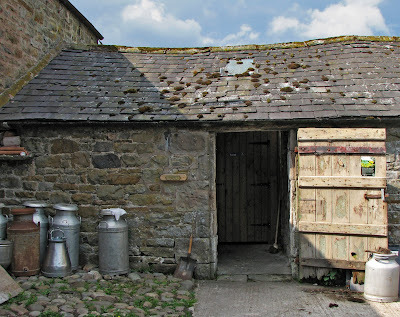 Large metal milk jugs are stacked outside the shed-toilet. Organic cows graze in fields behind. There’s one piece of home-made organic quiche, she says. I relinquish that to Ben. I’ll forgo the cheese today. They make their own cheese. Organic, she stresses. Never mind, I’ll have the soup. Red Soup or Green Soup. Named as they are, the options don’t tease my palate. I ask, “What’s in the Red Soup?” She utters rather smugly, “Red vegetables.” And in the green? I don’t ask. She thinks she’s clever. Against my better judgment, from the sparse selection on the board I choose Green Soup, which only interests me because it is served with Roman spelt muffins — a first-century bread recipe found at nearby Vindolanda, she says. She’s the owner, obviously proud of her organic fare. Can’t remember when she last stepped into a supermarket. Buys all her produce from local organic growers. Upstairs, there’s a loft with four small tables and a large window. We head for the view. I’m not happy with what I ordered. I want to change it but she’s disappeared into the kitchen. We are committed. My eye moves from the distant panorama to the scene just below the picture window. 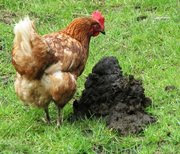 Transfixed on the manure pile with visions of “Green Soup,” I recall our College cafeteria where yesterday’s vegetables were routinely disguised into new and creative forms. Cauliflower-breadcrumbs-and-eggs, peas-and-carrots, all mashed into shapes, sometimes flat, sometimes round or conical, with gravy, always fried, never tasty even if named Petit Pâté d’Oeuf et Poissons. My soup arrives piping hot. My muffins, too. Ben’s quiche is served with a generous salad of wild greens and sprouts. I rarely butter bread but no amount of spread improves these muffins. They would start a food fight in College. While Ben enjoys his quiche, I offer a taste of my soup in hopes of a reciprocal gesture. I’m awarded a morsel. It is absolutely delicious. He declines my soup. A second bite of quiche is unlikely. I pour in salt and pepper. I’ve no idea what’s in the soup. It’s ugly. I’m starving so I eat without looking. I can’t look at the view, either. 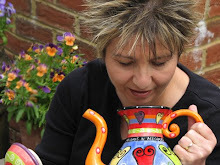 I contemplate offering her my mother’s lentil soup recipe aptly renamed “Birthright Soup.” Like Wallace and Gromit for Wensleydale, it would launch her little business into a new level. I don’t. Ben is quite happy with the meal I thoughtfully yielded. He is smiling. He throws a few salad sprigs my way. I do love the salad but I want quiche. Carnivore, vegetarian or vegan, click here for a memorable minute-and-a-half. You’ll never make spaghetti quite the same way again. Pes gets a million hits on his website per month. This is what free-range organic looks like. A petite figure garnished with pure white hair and sweet smiling eyes, the tour guide lectures in melodious speech with hints of Frenchness. Before this chance encounter we had explored the museum for several hours. We read the fine print beside each piece, studied brush strokes by hands of Masters. In the dimly-lit Rothko room that swiftly siphons joy, some gazed in awe, some in disbelief. After an informative film, I conclude no one’s interpretation of Modern Art is reliable, not even the artist’s. Each voice expressed in color, texture, shape, speaks to another in an unknown tongue. Awakening the desire to know, to understand, may be an artist’s highest purpose. As we eavesdrop on the tour in progress, the idea of a guide suddenly seems agreeable. We linger two steps behind. 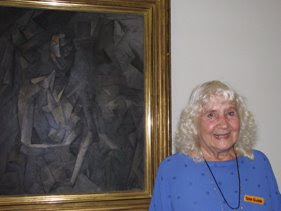 As promised, she says, she’ll conclude in front of Picasso. A handful of fresh-faced fans, hopeful models, tireless pilgrims congregated daily — not unlike those who spend nights on cold sidewalks for a glimpse of their favorite rock star. When the mood struck, Picasso would summon his butler to select a few and bring them in. After countless failed attempts, she learns Picasso likes Polish chocolates. With renewed optimism, candy in hand, she logs more time in line. One afternoon the door opens and she finds herself among the favored few. Crossing the coveted threshold, she presents the chocolates to the steward, wrapping now worn in a terrible state. He leads her alone up a long staircase, to a painting on the wall — a vulgar canvas he has recently rendered. She stares without reaction, stunned, dazed in his presence and by this exhibition of intense indecency. Our tour group moves in. She pauses. Months of anticipation — fondness, admiration, and now in the company of devotion — are intensely summed on her face. She clears her throat. Without delay, part embarrassed, part proud, part enraptured — not unlike the day she met Pablo Picasso — she turns and walks away. I catch her in the next room and ask if she would pose beside one of my favorites. She agrees. There are no signs but I suspect photography is prohibited in venues of priceless art. As security cameras move in, I expect someone to shout. I raise the flash (yes flash) and snap. The backdrop, a dark, enormous space. 2,400 flickering tea lights swirl translucent shapes on colossal pillars. Objects magnified, shadows long, sweet smoke of incense in the air. Outside, the wind dances with Cathedral bells. Forty days after Christmas, on February 2, the Feast of Candlemas celebrates the presentation of Christ in the Temple. “We’ll go to the grocery store, then the Cathedral,” we conclude, as if the 11th century structure is an ordinary detour on our way home. “Let’s get there an hour early for good seats.” The traditional mantra for every Durham Cathedral event we attend sets our schedule in motion. To arrive in time for optimal pew is a matter of [self-indulgent] principle. Arguments can spark over 5 minutes’ delay that threatens to jeopardize the supreme seat. If you were of small stature you’d understand. And the acoustics in the back two-thirds of the Cathedral are, well, unsatisfactory. The organ is not always played at optimal volume. If you don’t sit at the foot of the pipes, you can’t feel music in your bones. Up front. In the quire, if possible. Next to the verger, even. The seriousness by which we indulge in this endeavor, one might think we have no life. We arrive 55 minutes early. Once again, reminiscent of last year’s Easter sunrise service, we’re the first peasants to turn up. Lucky the door’s open, it’s freezing out. Inside, stewards are silently lighting thousands of tea lights. I volunteer to help. I am declined. Then, instead of walking directly to the coveted front row, I, in the spirit of graciousness, ask permission of a kindly steward. His reply is rudely interrupted by “the one in charge,” who points a long finger to the wooden bench at the back and says loudly, “Wait there till the candles are lit.” “But other people are in their seats...” she’s already turned her large stature to her next task, whirling her full-length faux grey-fox fir coat. Creating unnecessary draft. I repeat my plight to Ben. His countenance has morphed into “the serious face.” It is a look I know well. “I’m not with you if you cause trouble” are words unspoken. As soon as grey faux turns her busy back, I disappear into the shadows down the nave. The very front row is available but not always desirable. At the last minute this space may be reserved for participants. Or dignitaries. For peasants, four rows back seems safe. I save a place for Ben. The Cathedral seats a thousand, there are 5 people in the pews, best save a seat. The choir is rehearsing. I stare into the flames; eyes lose focus, mind wonders everywhere. Stop-motion stills over 900 years. I count the prayers that have been said here. The prisoners that have been held here. The carpenters, the masons, the monks. Of course we like! I interrupt my trance with this new concern. Baby steps. Deep breath, relax shoulders. As soon as the choir concludes practice, stand, very calmly, and move, no, glide forward — with a smile (friendly and vulnerable), slightly bowed (appropriate humility), head forward (bad posture), eyes fixed (assertive interest) — toward the quire. The quire affords a panorama of the darkened nave and a thousand flickering lights. We are each holding a program and a long taper candle which we light, one to another, before the ministers enter. Our service tonight will follow the mass from the Sarum Missal, in Latin. There will be no congregational hymn. We rise for the choir and priestly procession. A prayer. The choir sings the antiphon, and the priests, who just came in, begin to file out. The congregation is invited to follow them into the nave. We walk the full perimeter of the Cathedral candle-lit as the choir chants medieval plainsong. I’m directly behind a golden priestly robe and the incense-swinging clergy. I move into the path of fragrant smoke. I choke a little. Back in our seats, the men’s choir is accompanied by the Wetheringsett organ, a modern reconstruction* of the instrument common in churches around 1525. This tiny structure sits in the shadow of the resident Victorian pipe organ (98 speaking stops in 7 divisions). The Wetheringsett consists of only 46 notes, about 3.5 octaves. No pedals. Period music was written consisting of these notes only. While the organist plays, another works two enormous manual bellows. The sound is clear, lyrical, flute-like. Sadly, a blustery night and blizzard warnings have frightened the locals who found their home hearth or the neighborhood pub warmer than this service. In years past, Candlemas filled the Cathedral. Tonight there are fewer in the congregation than the choir and priests combined. Had more come, they would not have left disappointed. And there was plenty of room in the front row. 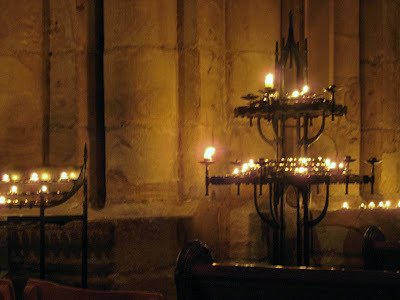 We linger to watch the candles extinguish, and leave quietly with the smell of incense in our clothes. *The Early English Organ Project was born out of a chance survival of an intriguing door in a farmhouse at Wetheringsett, Suffolk, found during conversion in 1977. The pattern of holes on one side and grooves on the other suggested a purpose, which was not revealed until shown to an organ specialist who recognized it as an organ soundboard of considerable antiquity. A replica of this pre-Reformation organ was completed in 2002 and has been touring various venues. There are no original (functional) surviving Tudor organs, and until now, very little information to go on. Music historians have had to rely on fragments, but with the 1977 find, it became possible to construct an authentic replica. Many cathedrals, even churches, had more than one organ. 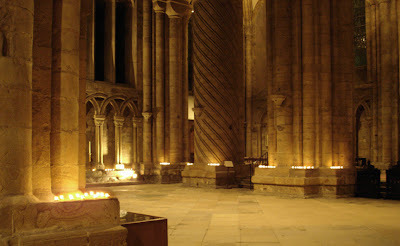 Durham Cathedral once had five, three of them in the Quire for use at particular altars. Cosmopolitan blog by a person of mixed-up background: Armenian, born and raised on the divided (Greek/Turkish) island of Cyprus, with a few sweaty years spent in Beirut, Lebanon. By my 18th birthday our family emigrated to UK. College in England and USA, married Ben and moved to Orlando, Florida (also sweaty but glorious air conditioning). In 2001 we “temporarily” relocated to England where Ben is completing a PhD in Theology at the University of Durham. We love the long summer days, local village walks, pansies on the patio, and the absence of cockroaches.